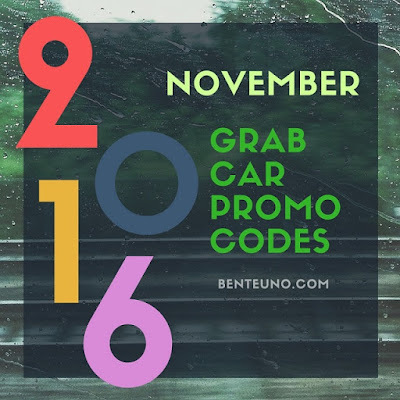 Here are the latest GrabCar Promo codes you can enjoy for the month of November. Don't forget to share this to your friends and loved ones! Prefer UBER? Take advantage of Benteuno.com's UBER Promocode BENTEUNOWUE. This UBER Promocode gives you PHP100 off (varies from country) and can be used anywhere in the world where UBER service is available. If you're reading this, you must be looking for the latest 2016 GrabCar Promo codes that you can use for November. Bookmark this page and enjoy! [Update November 30] Use GrabCar Promo Code BONIFACIODAY and get PHP50.00 off your GrabCar ride for today only! [Update November 19] Use GrabCar Promo Code GRABTONOELGC and get PHP50.00 off your GrabCar ride when book to or from World Trade Center in Pasay. Up to 2 GrabCar rides from November 18-30 only. [Update November 13] Use GrabCar Promo Code "HALFTHEPRICE" and get 50% off(max of P200) for 1 Grab Car ride. Valid from November 12-14 only. For GrabTaxi: Use the GrabTaxi Promo code: "SUNDAY" and get P40 off the booking fee for 1 ride. The GrabCar Promo Code "LONGWEEKEND" is valid until November 1. Use this GrabCar Promocode and get PHP 50.00 off on your two GrabCar Manila rides only. Use the GrabCar Promocode "CEBUAIRPORT" and enjoy 1 free ride worth PHP300.00. In case your fare is more than P300, you'll only pay the amount on top of 300. Valid til November 30, 2016 for both Cash and Cashless transactions. This GrabCar Promo code is valid only when you select Mactan Cebu International Airport as your pickup point to any point in Cebu covered by GrabPH.